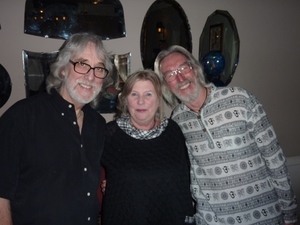 On Sunday February 1st I played a private concert which was part of a surprise birthday treat for Trevor Rolf's 65th birthday from his lovely wife June. 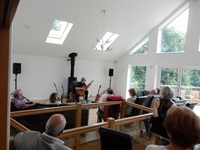 Being part of an evening such as this reminds why I so enjoy doing these private concerts, and helping to create a long lasting memory for the people involved. The venue was The White Rabbit pub/ restaurant/ hotel in Maidstone. Hilary and I decided to travel up the night before just in case the weather was bad. Fortunately it wasn't. The birthday boy arrived at around 6-o'clock and had no idea what was going on. The interesting thing is that Trevor does bear a striking resemblance to a certain acoustic guitarist albeit much taller than the aforementioned musician. You can see by the photographs the similarity in hair and beard colour and face shape. Hilary said we could have been brothers if I had brother that is! Sue and Mike Holton were part of the invited guests along with special friends and family. 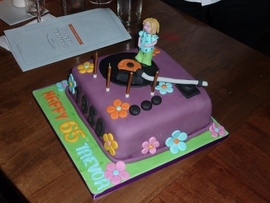 I truly loved every minute of it and can only wish Trevor and June all the best for the future and many happy returns to Trevor, who is without doubt a truly loyal and staunch fan of my music. Hilary and I thank them and in fact the whole family for making it SUCH a special evening. 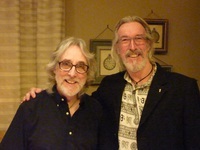 "One day in July 2014 I had the idea that I could get Gordon Giltrap to come along and play for my husband Trevor at his 65th Birthday celebration. I contacted Sue his agent and we talked about how I saw the evening going. I said I had a vision of just telling Trevor that it was a family dinner but after dinner Gordon would walk in and play for us. This developed over the following weeks. Sue talked me through everything that I needed to provide for the evening, making it as painless as possible. Eventually this is what happened after 5 months of lying to Trevor. On the 1st February 2015 we walked into the venue (Trevor still thinking he was going for dinner with just his close family) and there were his friends, family and Gordon together with Hilary, Sue and Mike waiting for him at the table. We all ate dinner together and then after a short break Gordon began to play, the room was silent apart from his music and everyone there has said it was the most amazing night ever. And Trevor !!! Well, he will never believe a word I say again but I think we all gave him a night to remember for a very long time". "Trevor here, where do I start? On the morning of my birthday June told me not to expect a party, we will be having dinner with my parents brothers and other halves. Walking into the until then quiet room, I was greeted by loud clapping and lots of laughter. My family were there so were some of my dearest friends, surprise enough I thought, then looking over to the end of the table I did a double take could it really be Gordon Giltrap? well yes it was! 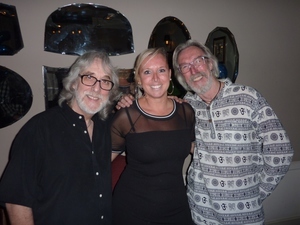 He was there as my birthday surprise, and what a surprise we all chatted for a while Gordon played a bit then we all had our meals, after which Gordon played for us in the way only he can, it was truly an unforgettable evening one I will never forget thank you Gordon. The meal and music finished we all chatted for a while and so the end of a perfect evening. In the morning to complete the whole thing we had breakfast with Gordon and Hilary after which more talking. We all left the White Rabbit around lunchtime, I was still pinching myself but soon realised it had happened. What a way to celebrate my 65th birthday, I would like to thank Gordon, Hilary, Sue and Mike and of course my dear wife June who I will never trust again! Many many thanks for making it so memorable hope to see you at a concert in the future". Even the cake was "themed" being a wonderful record player, and the disc? Gordon Giltrap of course! "What a privilege! We were fortunate indeed to be invited to a surprise special birthday event. It was lovely to meet Gordon and, on this occasion, his wife and his web-builder too. After a private dinner, with a little extra tune played for us as Gordon double-checked the sound-system after a temporary power failure - we were treated to Gordon's beautiful playing of some brilliant music interspersed with gentle and humorous repartee. One of the lovely things about this was his interaction with the audience. Gordon has a wealth of stories which are always kind and entertaining. We have seen and heard Gordon a number of times but this intimate setting has to have been the most special and the most memorable for all sorts of reasons!!"